Observation and adjustment gives the soldier a chance to practice adjustment of fire by observing traj ectory and impact or by re-laying often on the target using the sights. Live-fire training is held on the firing range after the methods are explained in the classroom. a. When firing on targets, adjust by moving the burst into the target. Based on the strike of the rounds, adjust the number of clicks for elevation and direction needed to move the center of impact onto the target. This does not call for the use of sights. For example, fire at a target 500 meters away; the rounds impact 20 meters short and 50 meters right. Use the T&E handwheels, moving the muzzle left and up the proper number of clicks, to manipulate the gun onto the target. b. Another procedure is the adjusted aiming point method. Use the sights and select an aiming point calculated to place the second burst on target. For example, fire at a 500-meter target; the rounds impact 20 meters short and 10 meters right. 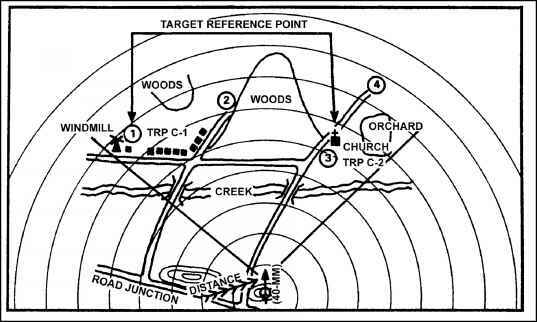 Rapidly select another aiming point about 20 meters beyond and 10 meters to the left of the target, lay on that aiming point, and fire.